Patients who underwent solid organ transplantation frequently suffer from different skin diseases, as consequence of the immunosuppressive treatment. Specific cutaneous side effects such as acne, hypertricosis or other pilosebaceous unit disorders, gingival hyperplasia, purpura or teleangiectasies are commonly associated to immunosuppressive medications. The majority of these conditions are benign, but the aesthetic concern may affect the patient is quality of life and reduce the adherence to the therapy. Moreover, solid organ transplant recipients frequently develop skin infections, as an indirect consequence of the immunosuppressive regimens. Herpes virus reactivation is more common few months after transplantation, whereas when the immunosuppression is reduced, the skin infections are mainly represented by human papilloma virus infections and localized mycosis. Bacterial infections are relatively rare. Long-term consequences of the immunosuppressive therapy are represented by development of precancerosis and skin cancers, with a risk that enhances over the time and a significant impact on patient survival. The aim of this paper is to provide an overview of the data published in the recent literature about this topic, in order to characterize the main skin disorders associated to the use of immunosuppressive drugs in solid organ recipients, giving information about their risk, epidemiology, clinical manifestations and management. 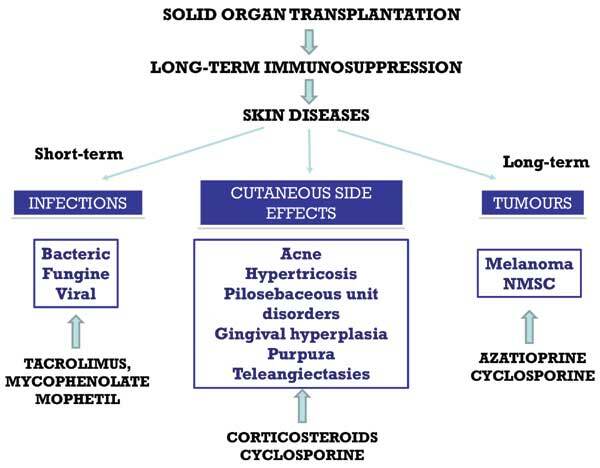 Skin, side effects, immunosuppressive treatment, solid organ transplantation.